Personalized Bear Silhouette Address Plaque - - perfect for your cabin in the woods, vacation lodge, mountain retreat, or metro Bear Crossing (imaginary or real). 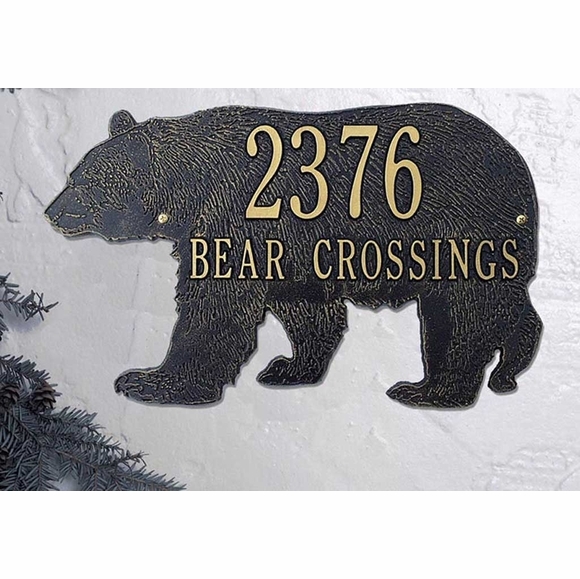 Bear shape address sign holds two lines of personalized text. Made in USA. Unique personalized wall mount sign is in the shape of a bear silhouette. Line 1 holds up to six 3" characters. Line 2 holds up to fourteen 1.25" characters. Color combinations: black with gold characters; antique copper; green with gold characters; bronze with gold characters. Dimensions: 15.5"W x 9.5"H; weighs 2.6 pounds. Bear Silhouette address sign personalized just for you. Made in USA. Thank you to the Dean's for the beautiful photo to go with their product review (see 1st small image from right above, click to enlarge). This was a gift, and my brother loved it! Beautiful address plate. Perfect for my best friend\\\'s Appalachian home. We love our Bear Name Plaque...it looks wonderful on our cabin...very nicely constructed...it made a an excellent Christmas gift !! !